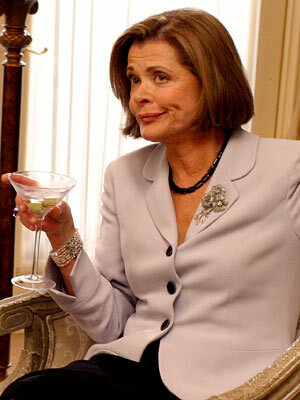 My plan was to get all Lucille Bluth-y for Mothers' Day, she being the patron saint of Awesome Mothers We All Aspire To Be. 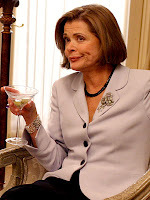 Besides, it's been a hell of a long time since I went to a bar at noon on a Sunday. But when the Resident Offspring and I walked into the Ship and Anchor at 12:05 pm for the final day of the Folk Festival Songwriting Contest, it was already packed, with people lining the walls hoping for a seat to open up. Lushes. We were starving, so we took off down the street for brunch at Nellie's instead. Sunday brunch - another activity I haven't indulged in for a hell of a long time! Nellie's was recently cited for health code violations, so I figured this was the ideal time to check out this little hole in the wall that everyone is always raving about. The negative press would make for a shorter lineup, I figured, and right now it was probably about as clean as it was ever going to get. We thought we would head back to the Ship and Anchor post-brunch, but by that time the crowd had spilled out onto the patio, where they seemed unperturbed by the light spattering of rain. So we gave up, went home, and I missed the opportunity to spend Mother's Day in a bar with my child. But the RO gave me a copy of The Medicine Cabinet of Curiosities for a Mothers' Day gift, which tied in perfectly with today's scheduled activity, a viewing of Body Worlds and the Brain. Absolutely fascinating. My initial thought, upon seeing my first plastinated cadaver, was how the muscles, bones, tendons and ligaments of the human thigh looked very much like a turkey drumstick. We really are all meat. With a few obvious anatomical differences, we are all put together much the same as any other animal. Also male genitalia is really funny looking without skin. Okay male genitalia is really funny looking anyway, but when you take away the skin, which gives it some semblance of dignity, you're just left with a handful of balls dangling from ligaments, like a cat toy on steroids. 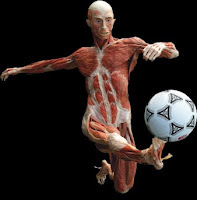 Many of the plastinates were physically posed to better demonstrate the impact of activity on the human body, playing soccer, baseball, figure skating, doing yoga. But the bodies I found particularly fascinating where those in which you could see and really appreciate the complexities of the layers that make up the human structure. The Drawer Man was my favourite; he really was quite beautiful, as they all were, but Drawer Man had the feeling of a work of art to him. An Escher perhaps. And because he still had much of his skin intact, he also maintained more of his innate humanity than a plastinate who was stripped down to the muscle layer. Medical students in anatomy classes receive their cadavers with the faces and the hands left covered up until those areas are dissected, because much of the personality of a body is found in the face and hands. It's true of plastinated cadavers as well. I found myself fascinated with the ballerina's hands, particularly with her cuticles, which were slightly ragged. Body Worlds is highly instructive, and we saw a few high school classes there today. But it is more than a simple anatomy lesson. It's an exhibition that raises as many questions as it answers, questions about humanity and ethics and life lessons and philanthropy and commercialism. You really should go. Cat toy on steroids. Oh my, lordy. I could not have said it better myself. As one of those that did a human anatomy course (for nursing school, not med school), I appreciate what you said about the muscles resembling turkey. While a few in our class were put off by the smell (the formaldehyde, not bodies), I thought I was getting along just fine. I did note, however, that the formaldehyde stained the muscles a brownish colour, which made them look like even more like meat. That fact only dawned on me when we discovered the lunch special at the hospital cafeteria that day was roasted pork. I recall discussing this exhibition in grad school as there was a vast difference between Body Worlds vs Body Works (I believe it was a UK vs NA thing). If I am remembering it correctly part of it had to do with the obscene admission price on one of them, as well as when the exhibition was first launched there was a lot of discussion over placement of the bodies, etc and whether or not consent had been given. Opening up topics of ethics, etc. I'll stop before I start to rabble...as I'm fuzzy on the details. I went to body worlds when it was in Vancouver a couple yeas ago. It was fascinating. I found myself wanting to know more about the people, their lives, their hobbies etc. I even downloaded a donation form which sits on my desk...not filled out. I saw Body Worlds a couple years ago and it was fascinating! Did you see the pregnant lady? The body goes through a lot to create new life. I'm truly sorry that you weren't able to get publically shitfaced with your daughter on Mother's Day. What in the world is this world coming to. Martha and I saw Body Works a few years ago, which goes beyond the muscle level into the organs. It was completely and totally fascinating. As a Zombie, you should know all about eating human flesh. Tough and stringy, isn't it? It was really the only fitting description, Lesley. Did you have the lunch special that day, John? I found I wasn't in the mood for turkey drumsticks yesterday, but I would have been able to eat them, being a good little carnivore. The Body Worlds exhibition actually went into a fair bit of detail about the donation process and the efforts to maintain anonymity of the donors, Al. I found myself wondering if the donors relatives had ever come to see the exhibition. How could I not, Dr M? I was really curious about the donors as well, Kelly. Do you think you will ever complete the donation form? I would come to visit you, and I promise not to laugh at your junk. The pregnant lady was fascinating, Missy, and somewhat disturbing. Of course I could not help but wonder how she had died. I found myself wondering that about most of the people. I found the pregnant woman's smoking-blackened lung unsettling. Tough and stringy, but very satisfying, . Body Worlds did have a fair bit about organs as well, which was really cool. My personal favourite was the cross-section of a massively constipated bowel, because I am such an 8-year-old boy. I really liked the pathology slides as well as the plastinates with little genetic quirks. Like the guy with the six toes or the kidney with two ureters. crap now i really wanna see it! THERE ARE BALLS! ~Jen~ Pardon my rudeness, but I believe those were either golf balls or tennis balls. Except for the big guy with the beach balls. Am I right, Zomb? Huh? Huh? They were among the most interesting pathology slides I have ever seen, RO. They helped to knock the few remaining memories of anatomy class right out of my head. Testes, Jen! You'd go crazy. The ones I saw were more of the ping pong variety, Charlie. I think they had to remove the beach ball fellow. Hey Barb! It's been a while! I would so love to go for this Body Works thing but I don't think it will ever make the journey to my neck of the woods. I'll stick with Image Googling it for now. And a very happy belated Mother's day! Oh but we would laugh with your junk, Kelly, not at it. Good to see you again! You really should go, Mariella, it is the perfect opportunity for anatomical sketching. It was not crazy busy, because you buy tickets for a specific viewing time. Course we went on a Monday. Thanks, BAP! This exhibition has caused controversy in places, that's for sure. I imagine it would in your neck of the woods.